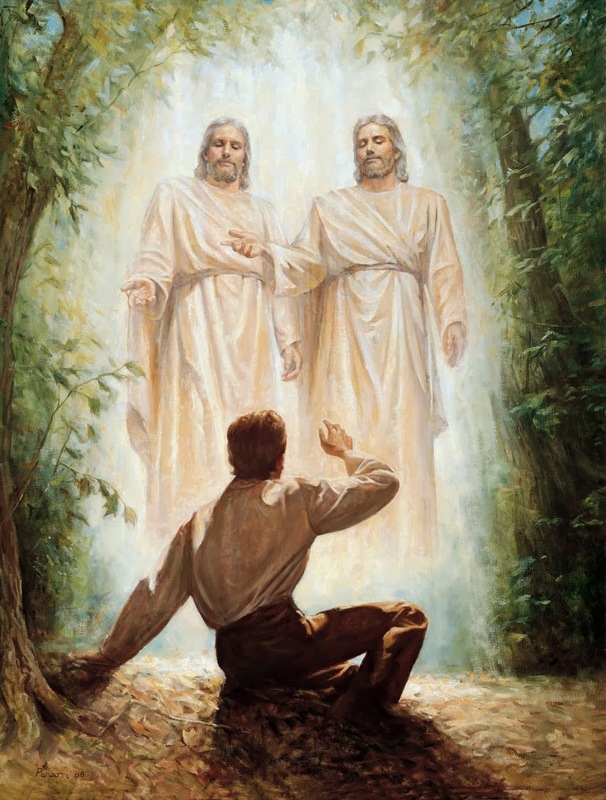 I had been aware that Joseph Smith had given differing accounts of his First Vision. Without anything to refer to I had relegated that interesting tidbit to the kind of changes I make as I retell a story. Different emphasis for different people. 1832 Account. The earliest known account of the First Vision, the only account written in Joseph Smith’s own hand, is found in a short, unpublished autobiography Joseph Smith produced in the second half of 1832. In the account, Joseph Smith described his consciousness of his own sins and his frustration at being unable to find a church that matched the one he had read about in the New Testament and that would lead him to redemption. He emphasized Jesus Christ’s Atonement and the personal redemption it offered. He wrote that “the Lord” appeared and forgave him of his sins. As a result of the vision, Joseph experienced joy and love, though, as he noted, he could find no one who believed his account.Read the 1832 account here. 1835 Account. In the fall of 1835, Joseph Smith recounted his First Vision to Robert Matthews, a visitor to Kirtland, Ohio. The retelling, recorded in Joseph’s journal by his scribe Warren Parrish, emphasizes his attempt to discover which church was right, the opposition he felt as he prayed, and the appearance of one divine personage who was followed shortly by another. This account also notes the appearance of angels in the vision. Read the 1835 account here. So in this account he relays that he doesn't know who is right or wrong, but believes he can get an answer from God, is thwarted from praying but then able at which point a pillar of fire with a personage appears, another identical personage appears, forgives his sins and testifies of Jesus Christ. Angels are also present. Age 14. 1838 Account. The narration of the First Vision best known to Latter-day Saints today is the 1838 account. First published in 1842 in the Times and Seasons, the Church’s newspaper in Nauvoo, Illinois, the account was part of a longer history dictated by Joseph Smith between periods of intense opposition. Whereas the 1832 account emphasizes the more personal story of Joseph Smith as a young man seeking forgiveness, the 1838 account focuses on the vision as the beginning of the “rise and progress of the Church.” Like the 1835 account, the central question of the narrative is which church is right. Read the 1838 account here. While I was laboring under the extreme difficulties caused by the contests of these parties of religionists, I was one day reading the Epistle of James, First Chapter and fifth verse which reads, “If any of you lack wisdom, let him ask of God, that giveth to all men liberally and upbraideth not, and it shall be given him. [”] Never did any passage of scripture come with more power to the heart of man that this did at this time to mine. It seemed to enter with great force into every feeling of my heart. I reflected on it again and again, knowing that if any person needed wisdom from God, I did, for how to act I did not know and unless I could get more wisdom than I then had [I] would never know, for the teachers of religion of the different sects understood the same [p. 2]passage of Scripture so differently as <to> destroy all confidence in settling the question by an appeal to the Bible. At length I came to the conclusion that I must either remain in darkness and confusion or else I must do as James directs, that is, Ask of God. I at last came to the determination to ask of God, concluding that if he gave wisdom to them that lacked wisdom, and would give liberally and not upbraid, I might venture. So in accordance with this my determination to ask of God, I retired to the woods to make the attempt. It was on the morning of a beautiful clear day early in the spring of Eightteen hundred and twenty.9 It was the first time in my life that I had <made> such an attempt, for amidst all <my> anxieties I had never as yet made the attempt to pray vocally. 1842 Account. Written in response to Chicago Democrat editor John Wentworth’s request for information about the Latter-day Saints, this account was printed in the Times and Seasons in 1842. (The “Wentworth letter,” as it is commonly known, is also the source for the Articles of Faith. )4 The account, intended for publication to an audience unfamiliar with Mormon beliefs, is concise and straightforward. As with earlier accounts, Joseph Smith noted the confusion he experienced and the appearance of two personages in answer to his prayer. The following year, Joseph Smith sent this account with minor modifications to a historian named Israel Daniel Rupp, who published it as a chapter in his book, He Pasa Ekklesia [The Whole Church]: An Original History of the Religious Denominations at Present Existing in the United States.5 Read the 1842 account here. When about fourteen years of age I began to reflect upon the importance of being prepared for a future state, and upon enquiring the plan of salvation I found that there was a great clash in religious sentiment; if I went to one society they referred me to one plan, and another to another; each one pointing to his own particular creed as the summum bonum of perfection: considering that all could not be right, and that God could not be the author of so much confusion I determined to inves tigate the subject more fully, believing that if God had a church it would not be split up into factions, and that if he taught one society to worship one way, and administer in one set of ordinances, he would not teach another principles which were diametrically opposed. Be lieving the word of God I had confidence in the declaration of James; “If any man lack wisdom let him ask of God who giv eth to all men liberally and upbraideth not and it shall be given him,”3 I retired to a secret place in a grove and began to call upon the Lord, while fervently en gaged in supplication my mind was taken away from the objects with which I was surrounded, and I was enwrapped in a [p. 706]heavenly vision and saw two glorious personages who exactly resembled each other in features, and likeness, surround ed with a brilliant light which eclipsed the sun at noon-day.4 They told me that all religious denominations were believing in incorrect doctrines, and that none of them was acknowledged of God as his church and kingdom. And I was expressly com manded to “go not after them,”5 at the same time receiving a promise that the fulness of the gospel should at some future time be made known unto me. Much shorter account, no identities of the identical personages, a charge that the gospel will be made known to Joseph. Age 14. So a few overall observations: It took almost a decade (more if you conclude that the 1838 account was not published till 1842) for the general membership to learn about the First Vision. There are some important differences between the accounts, including number of people, their identities, presence of angels, forgiveness of sins, and what the person(s) revealed to Joseph. It does feel like there is some progression in these accounts both in detail and in importance. Also it is curious that there aren't more accounts. None that date back to the original year 1819 either by Joseph, his family or others in his community. In the early 1830s, when this history was written, it appears that JS had not broadcast the details of his first vision of Deity. The history of the church, as it was then generally understood, began with the gold plates. John Whitmer (First church Historian) mentioned in his history “the commencement of the church history commencing at the time of the finding of the plates,” suggesting that Whitmer was either unaware of JS’s earlier vision or did not conceive of it as foundational. The First Vision is also not dated. (We know the exact day of Moroni's first visit - 21 September 1823) With Joseph's attention to detail and this being a monumental event. Why did he not record it till 13 years later? Why did no one in his family record it? Why don't we have a date? The essay goes on to include Secondhand Accounts. Besides these accounts from Joseph Smith himself, five accounts were written by contemporaries who heard Joseph Smith speak about the vision. Read these accounts here. Two glorious heavenly personages stood before him, resembling each other exactly in features and stature. They told him that his prayers had been answered and that the Lord had decided to grant him a special blessing. He was also told that he should not join any of the religious sects or denominations, because all of them erred in doctrine and none was recognized by God as his church and kingdom. He was further commanded, to wait patiently until some future time, when the true doctrine of Christ and the complete truth of the gospel would be revealed to him. The vision closed and peace and calm filled his mind. None of these accounts seem to give any confidence that the First Apostles of the Church of Jesus Christ knew about the First Vision prior to 1840. It seems that what we regard as the founding event of our history, was unknown to the first members (and apostles) of the Church till at least 1840. The First Vision is pivotal to our understanding of God and Jesus Christ as separate individuals but that is unsupported by the first account. The accounts seem to increase in detail and importance, becoming more convincing over time. No supporting information: records, dates, witnesses, journal entries, testimonials, for the First Vision seem to exist prior to 1832. So what are we to make of the 'First Vision' story that we base our faith upon? I read your post on the Patheos Blog site as well has this blog site, and I wish to make a hopeful coment, as one who has let go of many of the traditional tellings of our history. The study of Mormon history has been a wonderful experience for me. Awakening to a more faithful understanding of our history has greatly increased my gratitude for the restoration and has actually given me greater hope in receiving the promises of the Lord. One book I recommend reading is "Passing the Heavenly Gift" by Denver Snuffer. You can get it from Amazon. Snuffer suggests there is another, less glossy way to see Mormon history, apart from the traditional reading, and more in line with the prophecies found in the Book of Mormon. Yet upon reading it, one can come away with an increased belief in God and the restoration. Snuffer was eventually excommunicated for writing the book even though it brought people back into church activity and he remains true to his faith. His written other books that I have really liked, dealing with coming into the presence of the Lord, Their is no reason to losse hope in the whisperings of the Spirit that accompanies your experience in the Mormon church. There are so many wonderful doctirnes that can be learned outside the coorelated materials found in the church manuals. I really hope you will consider reading Snuffer's book. As for your comments about the four church essays, I think you are spot on about much of what you said. Just as a possible interest to you, I posted an amalgamation of the 11 contemporous tellings of the first vision. You can find it at "waxingportion.blogspot.com". The First Vision is an interesting subject, but through doing the amalgamation, my belief increased in its reality, rather than decreased. There is so much cool and idifiying stuff that can be awakened to when a new set of glasses are put on. I felt your concern that you had from the things you discovered but in reality, such an awakening is part of the process that brings not abondonment, but embracing of the wonderful blessings found in the words and records restored through Joseph Smith. By the way, Denver Snuffer also has a blog you may be interested in at "denversnuffer.blogspot.com". Nice work John I like what you did there! and yes it does read much more faith promoting. I once read John Bytheway's almagamation of the gospels was also very faith promoting. My only challenge with this is that while lovely it still doesn't explain that this pivotal event from our history was not available till 1840. It is either not pivotal as we believe or it was constructed. Denver snuffer who is referred to by the commenter above is a neighbor of mine. I have read his denversnuffer.blogspot.com and can tell you he is very interesting. Unfortunately, his cerebral approach to the Gospel can miss the mark as often has it may hit it. He was ex'd recently for being too critical of all the brethren past and present in his books. I will say that Denver is trying to bridge the cognitive dissonance that is the present cracking of the foundation for the Mormon church. He is the ultimate example of the remaining thinkers in the Church who know the issues with the historicity yet they find a way to stay in (in his case out, but still believing in the book of mormon). I would recommend you check out another brother's post who is known around the Wasatch front as "Bishop Earl". He is a genuine prototype former Bishop who has left the Church due to the foundational issues. Earl just exudes integrity and love. He is the real thing. (and it isn't Coke). He has posted a video of the core issues he found as misleading or untrue with church history. See his 17 minute video at exmormonfiles.com/episodes/17_minutes.htm . I have not had any contact with the church for 3 years. The issue for me that broke the "shelf" (or the camel's back), was the lack of reasoning given for the 2-4 year lag between the 2 priesthood visitations and their publication. We don't even have the exact date for the Melk restoration by Peter, J and J. There is no mention about these visions/experiences being taught until several years after the fact, maybe 1832. If you were visited by such persons, would you not think the entire church membership would know about that experience immediately and the date which it occurred? Check it out, the membership didn't know of these keys. And why not? No reason is given, not even a hint like he could have said they told him to keep it to himself. He never asserts this. Joseph just wove it into the fabric later. Was he ever the master weaver! Anon this time. (must stay low profile) My family is not aware of my apostacy. "How came these Apostles, these Seventies, these High Priests, and all this organization we now enjoy? It came by revelation. Father Cahoon, who lately died in your neighbourhood, was one of the first men ordained to the office of High Priest in this kingdom. In the year 1831 the Prophet Joseph went to Ohio. He left the State of New York on the last of April, if my memory serves me, and arrived in Kirtland sometime in May. They held a General Conference, which was the first General Conference ever called or held in Ohio. Joseph then received a revelation, and ordained High Priests. ...When he received this revelation in Kirtland, the Lord revealed to him that he should begin and ordain High Priests; and he then ordained quite a number..."
The priesthood thus conferred by holy Apostles Peter, James, and John embraced all of the offices of the priesthood from higher to lesser. The keys of presidency contained within the apostleship conveyed on that occasion represented the highest authority conferred upon men in the flesh. By virtue of these keys of priesthood, the Prophet Joseph Smith proceeded to ordain and set in order the various quorums as they are known in the Church today. In the restored Church, we often identify the term “priesthood” as “the authority to act in the name of God.” This accurately describes its function, but the dictionary meaning of the term is “the office of priest,” and that is precisely how it was used in Joseph Smith’s day. In Joseph Smith’s day, deacons and teachers were not considered to hold the “Aaronic priesthood,” nor were elders considered to hold the “Melchizedek priesthood.”Rather, as we read in D&C 84:29-30, “the offices of elder and bishop are necessary appendages belonging unto the high priesthood. And again, the offices of teacher and deacon are necessary appendages belonging to the lesser priesthood, which priesthood was confirmed upon Aaron and his sons.” ...The history kept by Church historian John Whitmer, describing the ordination of the first high priests in June 1831, says that Joseph Smith “laid his hands upon Lyman Wight and ordained him to the High Priesthood (i.e. ordained him a High Priest), after the holy order of God” (History of the Church 1:176, note). The words in parentheses were added by B. H. Roberts when he edited the history for publication, and were necessitated by the fact that the use of the term “high priesthood” to denote the office of high priest had changed by his time. " ...Book of Mormon scribe Oliver Cowdery, who recorded the minutes about the “high priesthood” in 1831, did not use the term “high priest” or “office of high priest” because he was following the Book of Mormon's equation of “high priesthood” with the office of high priest.In fact, everyone in 1831 would have understood that Sidney Rigdon even spoke “to those who were ordained to the Highpriesthood [sic] last evening . . . [about] their indifference to be ordained to that office . . . setting forth the power of that office” (Sidney Rigdon statement, 26 Oct. 1831,Cannon and Cook, Far West Record, 26, qtd in The Mormon Hierarchy, 29). (COMMENTARY /QUESTION: Does this make much sense given that the Book of Mormon narrative was not withheld from the Church or Public at that time? How much more would the revealing of visitations by angels holding Priesthood keys have added to the persecution? I don't imagine it could have been a concern since the visit by Angels bringing the golden plates had put a target on his back by the critics. Nothing he would have added by stating the Priesthood restoration facts would have made any marginal difference in the degree of persecution. If he was so afraid of persecution he wouldn't have published the Book of Mormon. As pro-LDS historian Richard Bushman admits in his landmark biography on Joseph Smith (Rough Stone Rolling, 75): “the late appearance of these accounts raises the possibility of later fabrication”—even though he doesn't draw that conclusion himself.Many thinking Mormons do raise that possibility, however.In a nutshell, they believe that there are good reasons to doubt the restoration of the priesthood actually happened in the church, despite Joseph Smith's later descriptions of the events in his 1838 History of the Church.The actuality of those angelic events and the exclusivity of power/authority which such events would denote, are highly questionable. Were the restoration of the Aaronic Priesthood under the hand of John the Baptist recorded in the church prior to 1833, it would have appeared in the Book of Commandments somewhere between Chapter IX and Chapter XII (based on the currently named date of 15 May 1829).It's not there, nor anywhere in the BofC.Were the restoration of the Melchizedek Priesthood under the hand of Peter, James, and John recorded prior to 1833, it would have appeared somewhere between Chapter XII and Chapter XVII (the first of the revelations recorded on the day of the church's organization, April 6, 1830).It's not there, nor anywhere in the BofC. The church's converts heard nothing of the appearance of the ancient apostles to restore priesthood power and authority to Joseph and Oliver, were not taught that the offices in the church to which they were ordained were “priesthood” conferrals, heard nothings of two distinct orders of the priesthood in the early years of the church, per Book of Mormon witness David Whitmer and early apostle William McLellin: see (Whitmer, quoted in Early Mormon Documents, ed. Dan Vogel, 5:137). see (Whitmer, An Address To All Believers in Christ: , pp. 32, 33, 64) see (McLellin, quoted in Grant Palmer, An Insider's View of Mormon Origins, pp.224-25). The early revelations of the church set no precedence for one's need for “priesthood authority” in order to be called of God, ordained (accredited) to an ecclesiastical position within the church, engaged in the work of preaching repentance and baptizing for the remission of sins, nor to ordain (set apart/accredit) others within the church. Book of Commandments 3 states, “If ye have desires to serve God, ye are called to the work . . . and faith, hope, charity, and love, with an eye single to the glory of God, qualifies him for the work” (D&C 4).No priesthood requirement mentioned! In Book of Commandments 15, the revelation states that Jesus Christ (not John the Baptist) had commanded Joseph to baptize Oliver (D&C 18).In that same revelation, it states that having the desire to take upon them the name of Christ is the only requirement for the calling of the Twelve disciples. Even Joseph's own family heard nothing from him concerning the two priesthood restoration events. D. Michael Quinn noted that when Joseph's mother, Lucy Mack Smith, wrote a letter in 1831 to her brother to tell him about the new church, she made no reference to the angelic visits of Joseph's later telling (Origins of Power, p. 19). As Grant Palmer has noted, “Accounts of angelic ordinations from John the Baptist and Peter, James, and John are in none of the journals, diaries, letters, or printed matter until the mid-1830s” (Grant Palmer, "An Insider's View of Mormon Origins", pp. 223-224). In 1829 Joseph said he was called by the Spirit; in 1832 he mentioned that angels attended these events; in 1834-35 the spiritual manifestations became literal and physical appearances of resurrected beings. Details usually become blurred over time; in this case, they multiplied and sharpened. Oliver Cowdery remarked in 1848 about his attendance at the restoration of the Melchizedek Priesthood: "I was also present with Joseph when the higher or Melchizedek Priesthood was conferred by the holy angel on high.This Priesthood, we then conferred on each other by the will and commandment of God" (recorded by Bishop Reuben Miller and quoted in History of the Church, Vol. 1, p. 40 footnote). Despite Joseph's 1838 claim that three angelic personage, Peter, James, and John, had come, why did Oliver forget and refer to them as “the” holy angel? There is a brief mention of the event in Oliver B. Huntington’s journal, which places the Melchizedek ordination on a night after Joseph and Oliver had been on trial in Colesville, New York (Journal of Oliver B. Huntington, 13 January 1881). Joseph Smith dated this incarceration in mid-to-late June of 1830 (History of the Church 1:84-85, 92-94). Wesley Walters located the court bill for this trial, which was dated “July 1st 1830” (Joseph Smith’s Bainbridge, N.Y., Court Trials, p.125). That date is several weeks after the Church was organized. But LDS sources are emphatic that Smith could not have legally organized the Church unless he had received the Melchizedek priesthood first. That creates an irreconcilable problem for the LDS claim of authority. (Lane Thuet, “Priesthood Restored or Retrofit? '” http://www.mrm.org/priesthood-restoration. It appears from historical records that before 1831, specific males in the church were called to “church offices—elders, priests, and teachers—given authority, and licensed without reference to a bestowal of priesthood” (Rough Stone Rolling, Richard Lyman Bushman, pp. 157-158).Even at the April 1830 meeting in which the church was formally organized, Joseph Smith ordained Oliver Cowdery as “elder” and then Cowdery ordained Joseph as “elder,” with no mention made of these ordinations being tied to “priesthood” authority. Many of the elders present at the conference of elders in June 1831 wrote personal accounts of the lengthy meeting, a pentecostal-like event during which Joseph Smith and others laid their hands on one another to confer upon each the “high priesthood” for the “first time”. That Joseph received the high priesthood himself under the hand of Lyman Wight (Rough Stone Rolling, Richard Bushman, p. 158) indicates that he did not believe he had received the high priesthood before that time (1831).What does that say about the alleged visit of Peter, James, and John? Book of Commandments Chapter 28 was originally a 193-word revelation explaining what could be consumed for the sacramental wine. The heading to Section 27 of the D&C states that “In preparation for a religious service at which the sacrament of bread and wine was to be administered, Joseph set out to procure wine for the occasion. He was met by a heavenly messenger and received this revelation, a portion of which was written at the time, and the remainder in the September following.” In 1835, Smith and Cowdery added 456 additional verses to that chapter! Did a heavenly messenger really state all 649 words which Joseph miraculously remembered later, or did Joseph take liberties with the text for his own purposes? 5 . . . marvel not, for the hour cometh that I will drink of the fruit of the vine with you on the earth, and with Moroni . . . 7 And also John . . .
8 Which John I have sent unto you, my servants, Joseph Smith, Jun., and Oliver Cowdery, to ordain you unto the first priesthood which you have received, that you might be called and ordained even as Aaron . . . It must have seemed convenient to now have a revelation mentioning the priesthood restoration events, making the priesthood restoration claims seem smooth and coherent. Will our salvation depend upon trusting the authority of a man who felt at liberty to quietly change revelations he'd formerly “received” from God?Why doesn't the church inform members of the changes Joseph Smith made to his revelations? Is it possible that having faith in Jesus Christ is the reason the Saints receive blessings and not due to the "authority" of someone praying over them? This makes a lot of sense when taken into context of other Christians who experience the blessings of healing and answers to prayer who are not of the Mormon faith. ps. Ganesh, my sincere best to you. I would have emailed this info but didn't think that would keep my anonimity. I have never made a church history comment on any site before, but felt something moved me on your blog. I got an impression that you are ready to hear this. May God bless you as he has me and my family (my wife and children left together with me). We have had nothing but blessings for the past 3 years and turn our hearts over to Him. Thanks anonthistime! So basically there is no record of any priesthood ordination by either John the Baptist or Peter, James & John prior to 1835. This seems consistent with 'First Vision Accounts' problems.... but not consistent with the story we tell about the restoration of the Priesthood. I had something written out and internet deleted it all. Oh well. In short now i would just like to second John Chase message. Even offer to buy the book. Christ lives, joseph smith is a prophet of God and he still is. No matter what church history entails, and there will be many more forth coming "problems" I am sure. Too bad wishing the church to be true doesn't make all the deception and evidence go away. When we establish that the church lies to it's members, that's the exact moment we can rule out that it is true or even good. That much seems obvious, so let's ask the real question: why does the church lie? It's actually an easy one too. Because the church knows its not true, it has a lot to hide and doesn't want to lose tithing money. Ganesh, you have done a wonderful job in documenting the process of your critical thought. You seem to be very thorough. Does the church deserve you as a member when it doesn't respect you enough to fully disclose the basic facts of its history? It could be that you find yourself more effective from within, and that is for you to decide. For me, having my name on its records is a show of support I will not give any longer. I taught lies for 2 years on my mission. 2 important years that I fully dedicated. I cannot forgive that and it turns out that I don't need to. The buck stops here. Many will discover that JS committed 'deception" "fraud' "always on the run" and kept his priesthood ? His own scriptures says in D&C 121:37 "Amen to the priesthood or authority of that man" so anyone who received any priestly authority from him (following those sins that would have disqualified him) would be questionable. Would they essay on the Kirtland Banking Society next ?. Wobee K - enlighten us on the Kirtland Banking Society please. Is it really the founding event of our history? What does that mean exactly? You could draw on multiple events. Most people (including Brigham Young) were converted based on the Book of Mormon without even meeting Joseph Smith or possibly even hearing about the First Vision. I agree AlexH that it doesn't have to be the founding event, and it certainly wasn't for Brigham Young and all others before 1840. But it is for us now. It is the thing we tell first about our history, and expect to define our testimony of Joseph Smith and the restoration. I was directed to your blog from Patheos.com where I read your guest post with great interest. Are you real? Sorry, you just never know who is who on the net these days. Anyway, I wondered if I could perhaps inspire some thought and maybe even a future blog post on some of the comments in Spencer W. Kimballs book The Miracle of Forgiveness. I was given that book to read as a teen many years ago and never quite recovered. My specific concern was that my virtue was of greater value than my life. It implied that I would be better off and that my parents would have preferred that I had fought to the death rather than succumb to sexual abuse as I had done. I remember feeling quite devastated at this notion. I remember at that moment looking at my father through different eyes. I remember vowing I would tell my future daughter to live, to always live, because I loved her. My other concern was regarding homosexuality as I had a close friend who was struggling with his homosexuality at the time. But it was a long time ago. I am sure if I were to read the book again today there would be many other things that would make me shudder. With all these essays, and with particular reference to the one regarding race and the priesthood, I find myself wondering if at some point the church will denounce or attempt to redefine President Kimballs comments about my life and my virtue, and the claim that homosexuality is a disease that can be cured? Will the book be edited, or perhaps even taken out of print. Will an essay be written stating that these comments were made by Kimball the man rather than Kimball the prophet? If this is the case, how are members to sustain any man as a prophet? How can they take guidance from the leaders if they at any time can change tack? "Many members feel that officially changing or denouncing the teachings of earlier prophets is simply confirming the 9th article of faith: "We believe all that God has revealed, all that He does now reveal, and we believe that He will yet reveal many great and important things pertaining to the Kingdom of God." - but for many this simply raises questions as to the legitimacy of Mormon prophets, concerns over a god who seems to change his mind and fear that we may ourselves perpetuate a lie in good faith, only to be told we were given the wrong information, by a man who is supposed to be the mouthpiece of god." Anyway, I am prattling on a bit, but I really would like to know your thoughts on Spencer W. Kimballs book and specifically the issues mentioned. You bring up a very interesting question, which deserves its own blog. One of the statements that comes up from well meaning members justifying believing without question is 'well if it is not true, we have still lead a good life'. This gets problematic very fast. Because we draw so many spurious lines between good and bad there is huge guilt in the church, and extreme behaviour that follows. Elizabeth Smart said the reason she did not try to escape is that because she thought she had lost her virtue she felt worthless and resigned herself. Some may say she did not understand, but quotes like you reference from Spencer W Kimball have created that feeling. I tried to address this a little in my blog, siting some self righteous behaviour because of something I had been taught. As you become aware you realise that these distortions are all over the place, its woven into everything we do. i.e We value marriage and marriage in the temple.... so everyone who is single at some point will question their worthiness and live with huge amounts of guilt and maybe even trauma. Those not 'worthy' to get married in the Temple will doubt their marriages validity, and single sisters will forgo a relationship in this life for a future post mortality sealing in a polygamous union. I saw that you had some concerns a while ago about possible misrepresentations by the Church. Were you ever able to sort that out? Send me an email and let me know. I would love to hear your perspective and I may be able to shed a little light on the matter too!